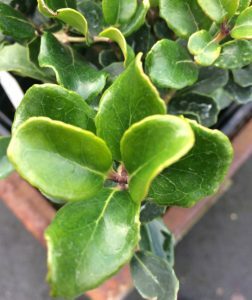 A really cool looking broadleaved evergreen shrub with thick glossy leaves that are essentially square with undulate (wavy) margins. 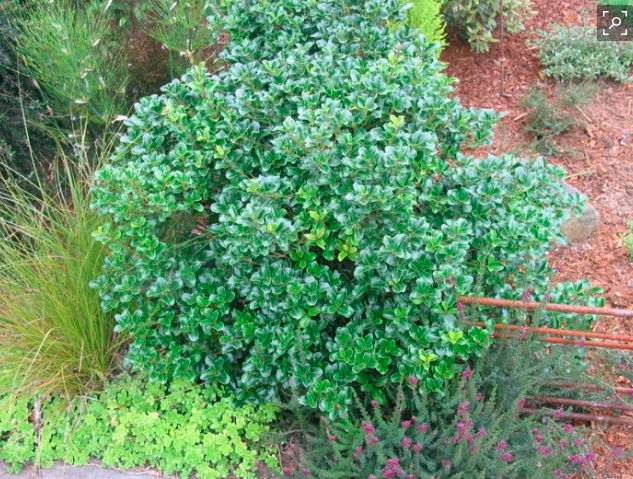 Dense growing shrub that can get quite large without pruning intervention. In October to November masses of tiny white flowers cast fragrance in the autumn air. Full sun to part shade in well drained soil of average fertility. No summer water necessary when established. Excellently adapted to our climate. 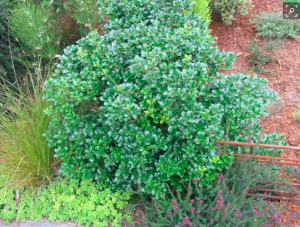 Makes a novel hedge or a pretty specimen. Extraordinarily cold hardy – below 0ºF. 8′ x 8′ in 10 years.